While he was finishing the score of "The Firebird", the idea came to Stravinsky for a pagan, ritual scenario. The background history of "Le Sacre du printemps" is well known: while the modernists praised the work, the conservative public thought they were being hoaxed. The reason for their irritation and the scandalous fiasco of the premiere is still audible to this day. 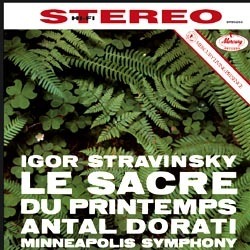 Stravinsky carries the aggressive, hammering rhythms to the extreme, casting them in atonal harmonies which feed on the alternation between a »red-hot and a mild mixture«, as Stravinsky put it. Dorati urges on his ensemble with robust tempi, and the orchestra is quick to respond to all the refinements of the tightly knit movement. It appears to cope effortlessly with the extremes of contrast and manages to amalgamate the rhythmic excesses with the tenderness of the numerous tiny motifs and figures which seem to sprout like flowers out of hard rock. The excellent recording technique captures both the extreme loudness and the finely pulsating tones, resulting in a sound in which no detail goes unheard. 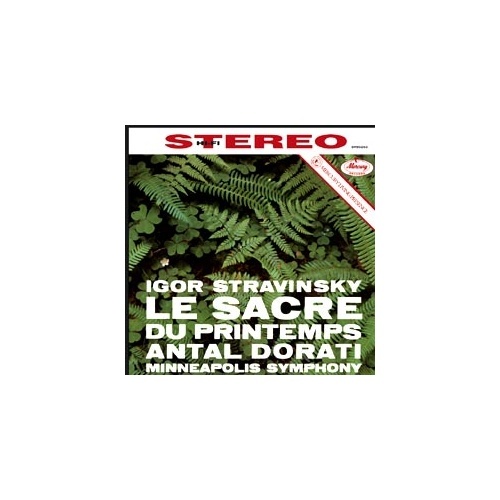 The listener can be sure that this Stravinsky deserves the rating 'excellent' – both for the interpretation and for the sound.